These poems, verses and reveries, have been gathered over the last few years since my first collection of poems and drawings, Sandalwood Thoughts, and the second book, Dots and Cross, a long prose poem. Some of the verses written in the form of ghazals in a classical Indo-Persian style, evoke memories from decades ago, when some lovers of the Urdu language opened a dimension which was new to me. 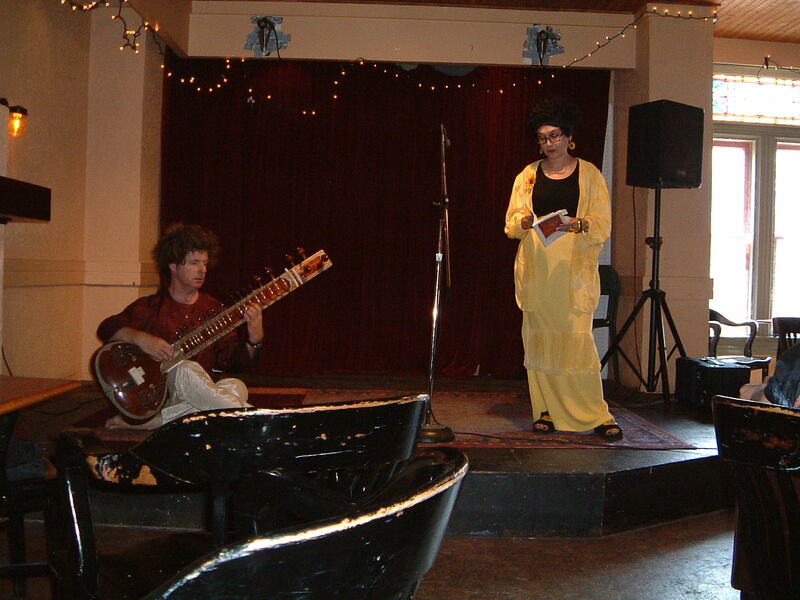 As a Bengali girl schooled in English and Hindi, I was unaware of the intricacies of Urdu, of the nuances, of the guttural sounds, of the textures. In these ghazals, written in English, I have aspired to capture some of the romance infused in an Urdu ghazal. To those lovers of the language, I owe much gratitude for imparting some of their love to me. As always, I have relied on the emotional input and the creative editorial eye of my son Shahan and daughter Shayona. 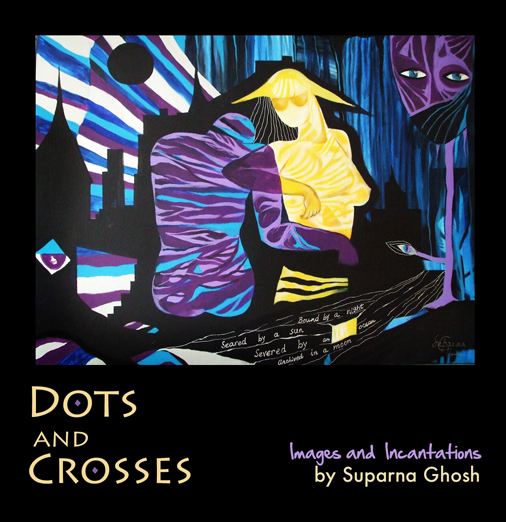 Dots and Crosses is an epic poem about love and loss and love regained, about life and death and life regained. Originally published in book form, in 2009 I released an audio version on CD, set to original music. Click the play buttons below to hear select tracks. 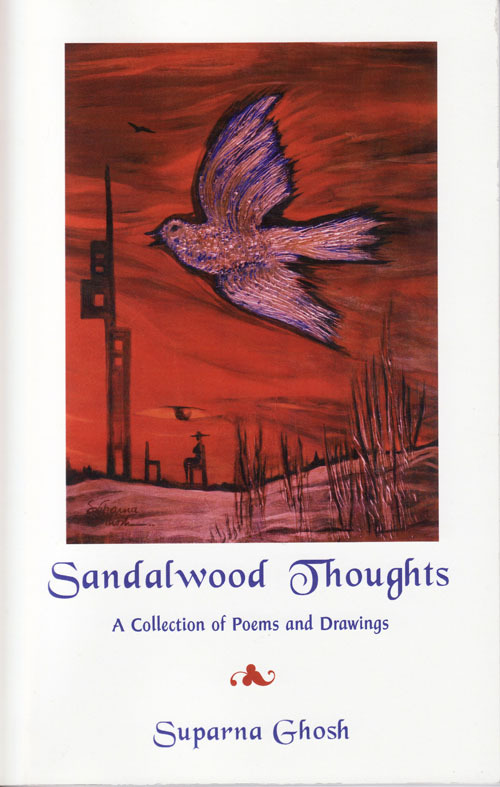 Published in 2004, Sandalwood Thoughts is a series of poems written over a span of several years. Some were previously published in India, a few in England, and others were inscribed in paintings. Sandalwood Thoughts is available on Amazon. From every page of this volume emerges the personality of the writer as a perceptive and talented bi-media artist who knows and means what she writes. Her felicity of expression attracts re-reading of her poetic texts and re-viewing of her drawings.